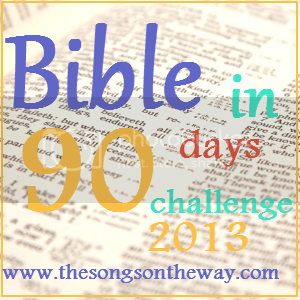 Okay, as far as the Bible in 90 days challenge goes... I'm way behind. I'd read ahead before my wedding, but then with the disappointment of having it pushed back a day I didn't read after getting ahead, so that I guess I was even going into the honeymoon. I thought I'd read on the bus, but I got motion sick, so I only read maybe three chapters. During the rest of the honeymoon I maybe read another four chapters here and there, meaning I didn't even complete one full day for the six days of our honeymoon! Since I've gotten back, well, I'm out of the habit. So like I read two full days on Thursday I think, then forgot to read any on Friday, then read half a day Saturday, etc. So I'm about a full week behind now. That being said, I can tell myself two things: one, we're still not halfway through so by no means is there not time to make it up and two, there are two "free" days budgeted in for the whole 90, so I guess I've used them, which only makes me five days behind! As far the "More than this Monday" part goes, there's good news and there's bad news. I have the ideas for like three terrific posts. I have not taken the time to write out any of them. So since my Monday here in India is nearly over instead of seeing if I'll find the time, I figured I'd put up the linky and read your awesome reflections instead of worrying about mine and sometime in the next week write out the three great ideas so that this won't happen next week and if it does happen again, I already have a post waiting for me to just publish. Looking forward to seeing how you are doing in the challenge and/or your deep thoughts for the week! Glad you are back and I am looking forward to reading all about it!